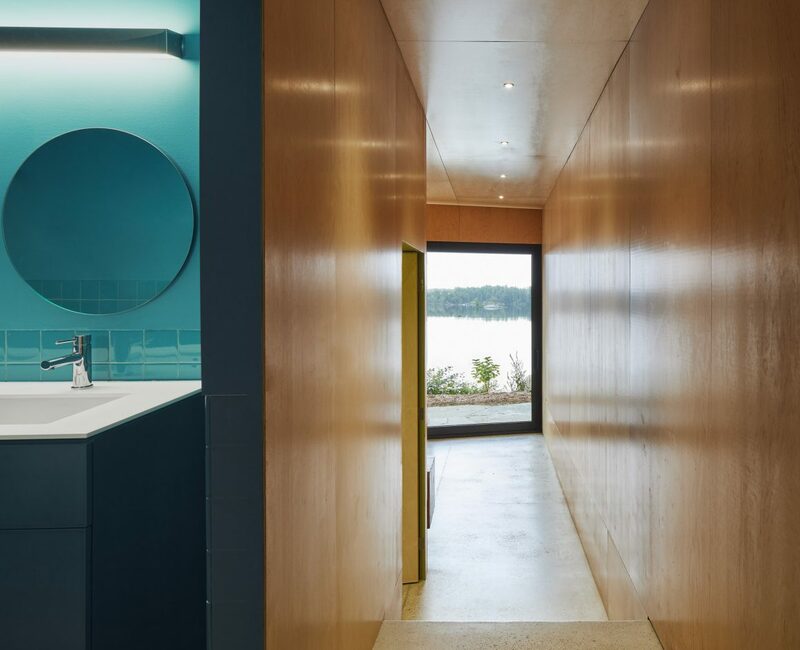 The design team ofCoryn Kempster and Julia Jamrozik got clear instructions when they were asked to design a modern four-season home on a waterfront property. 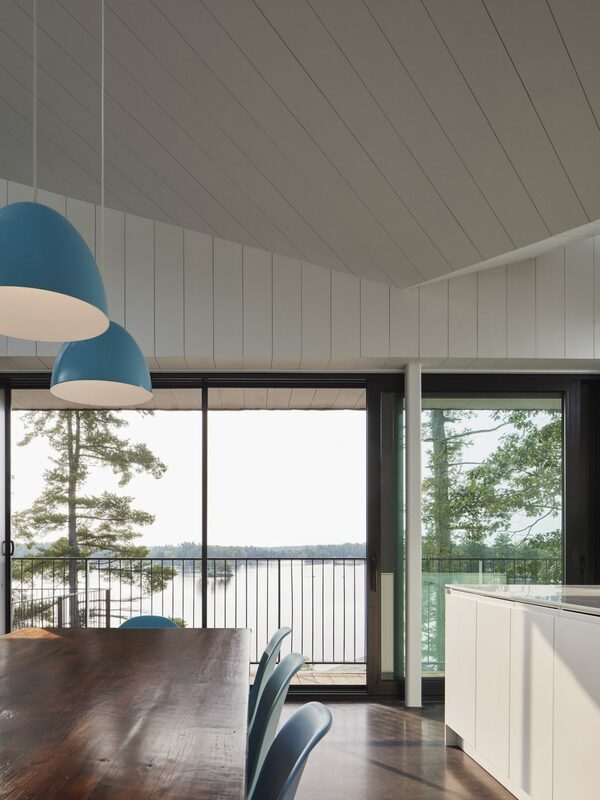 The couple who owned the property on Stoney Lake, northeast of Lakefield in the Kawartha Lakes cottage region, and who issued the instructions, were open-minded about the design possibilities but they were steadfast on functional requirements. Lake views were a must, of course. The property was, after all, located on a spectacular point on the lake, in the heart of the Canadian Shield. A functional open-concept living space was a request of the owners, who wanted to be able to host family and friends comfortably. A banister around a staircase at the far end of the room leads to the cottage’s lower level, where the bedrooms are located. But there were other things the couple wanted. Visitors with mobility issues had to be able to get into and around the building. The sleeping and living areas inside the cottage had to be separated to ensure privacy and quiet. The building had to be environmentally friendly. The surrounding landscape had to be left as undisturbed as possible. And on top of it all, the finished product had to be fun. 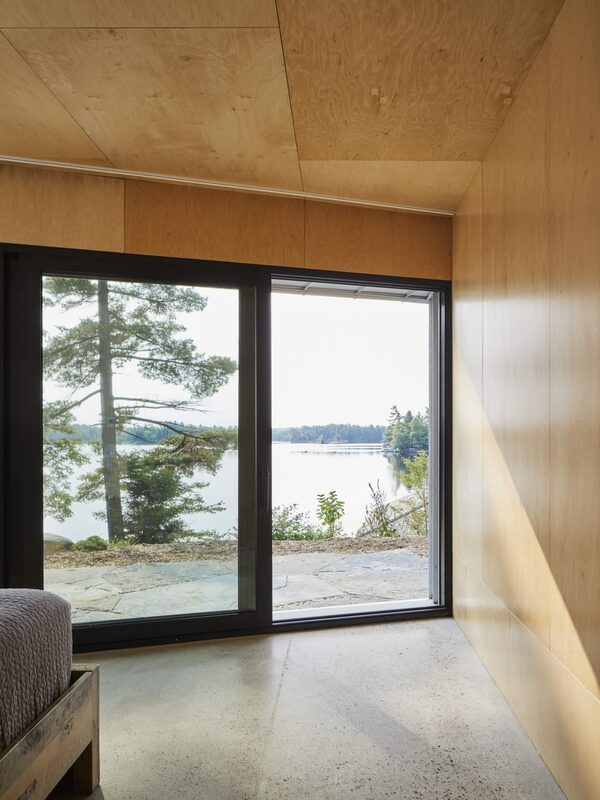 To maintain the cottage’s simplicity, its walls are finished in strips of white-washed plywood, and the concrete floors are stained charcoal. 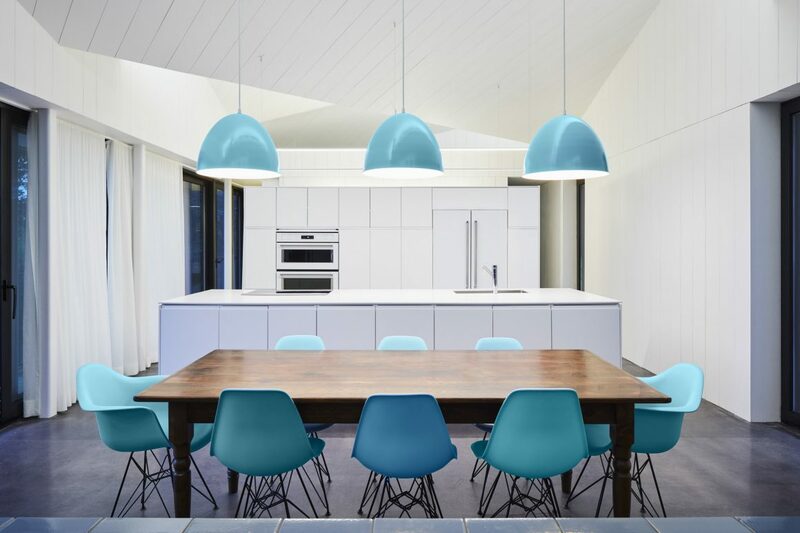 Turquoise and blue lend a little punch via light fixtures and furnishings. 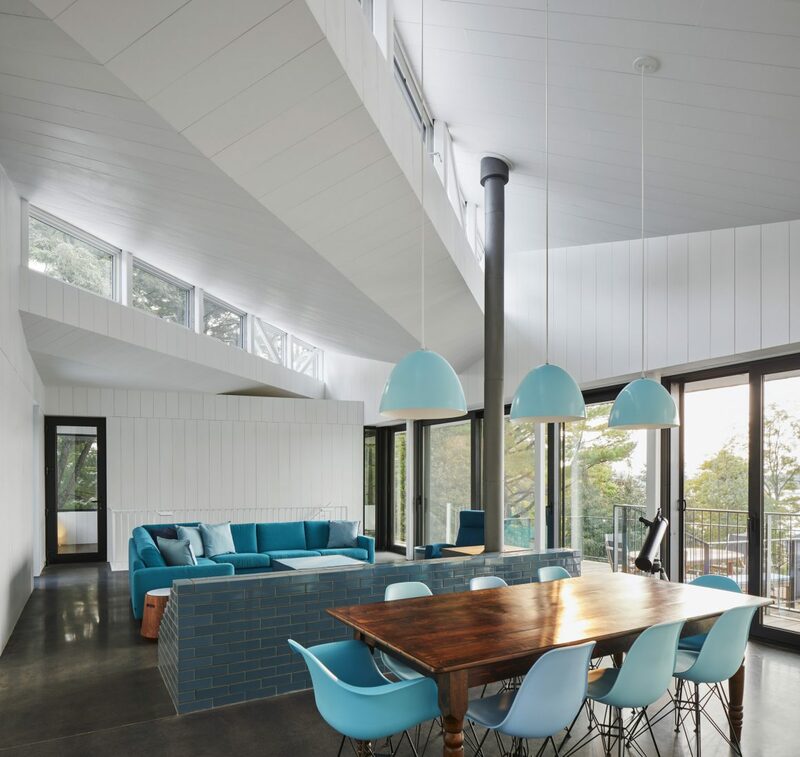 The end result, Sky House, as it was named by the owners’ 13-year-old daughter, ticks off all the boxes – and many more. 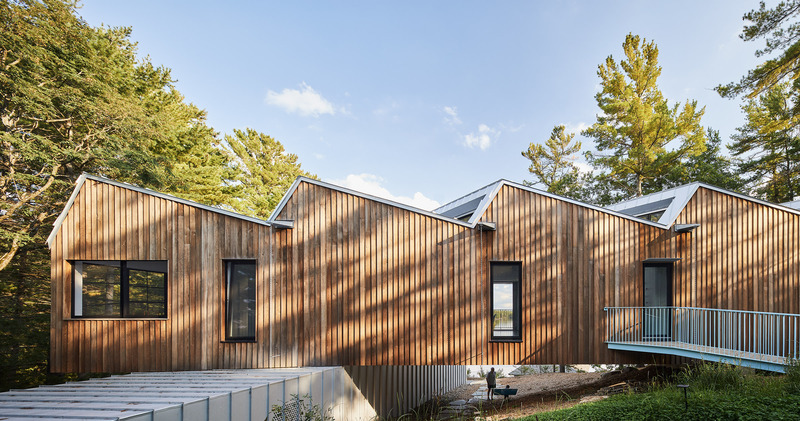 Nestled into the side of a hill on the 1.37-acre property and surrounded by water on three sides, the 3,100-square-foot structure brings new definition to cottage design. It is quirky, contemporary, and technologically state-of-the-art, outfitted with a raft of energy-efficient design features, such as a series of four vertical skylights oriented to true north for maximum daylight without heat gain, and an equal number of solar panels pointing in the opposite direction to soak up the sun’s energy. The building looks deceptively small for its ample size, and its construction required no blasting of the bedrock or felling of trees. And the best part of all: the couple was pleased that the building will be able to serve their needs as their family grows. 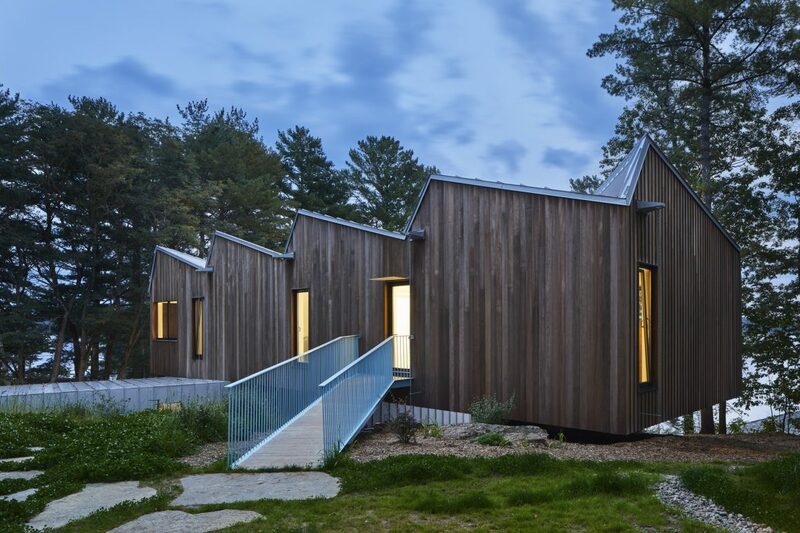 “The building had to be generous and flexible to accommodate the small family as well as visiting friends and larger family reunions,” says Julia Jamrozik, the co-designer of the 18-month-long building project, built by Timberline Custom Homes. 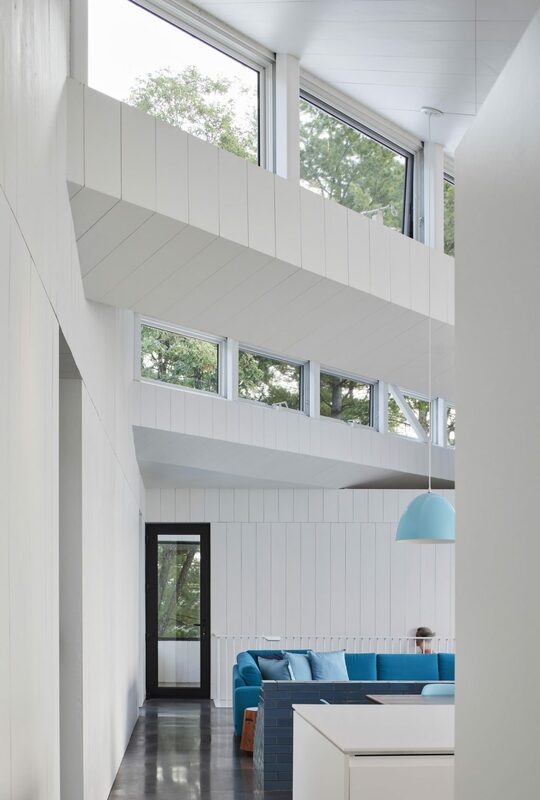 Clerestory windows located just below the roofline accentuate the main room’s height and breadth while allowing natural light and fresh air to stream into the large living space. As a visitor approaches the cottage from the driveway in front of it, the first thing that’s noticeable in the foreground is a long wheelchair-accessible ramp, painted bright turquoise blue, that leads to the front door of the pine-clad cottage. It is just one of the many places where this colour is featured. The owners chose it to bring a sense of fun to their lakeside home and convey a unified yet whimsical feel. They also thought it was a cool and calming colour for summer. 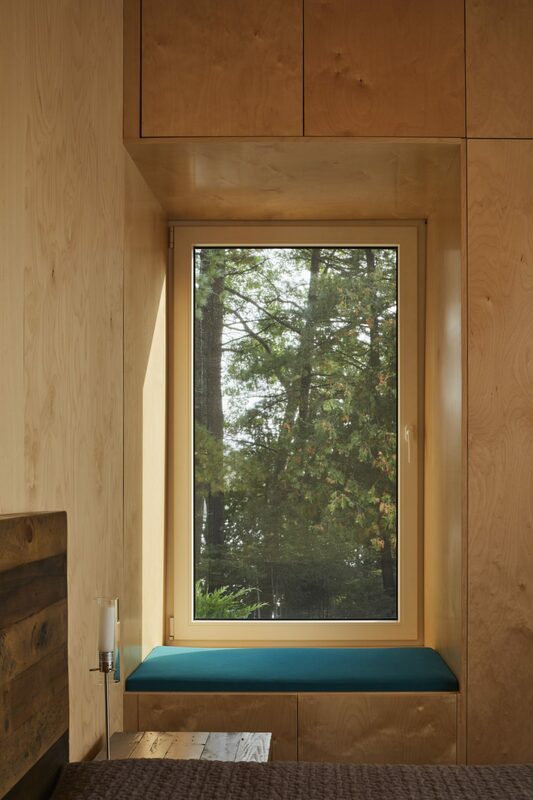 Warm and cozy is the feel of the cottage’s lower level bedrooms thanks to clear-coated plywood walls. “We wanted our cottage to feel like a cottage, not a suburban home,” says the owner. 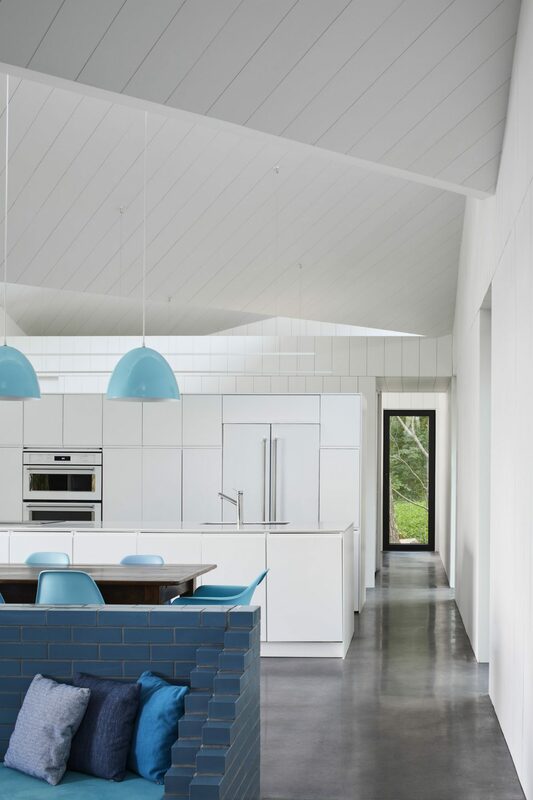 Coryn Kempster, Jamrozik’s professional partner – and husband – explains the two-storey cottage is really two separate Lego-like building blocks placed one atop the other at a little more than a 90-degree angle, a design he and Jamrozik came up with in order to diminish the overall impact of the building on the landscape. One end of the top block, which contains the living and dining rooms and kitchen, rests on the highest point of the property and touches down in perpendicular fashion onto the roof of the lower block, which contains the bedrooms. 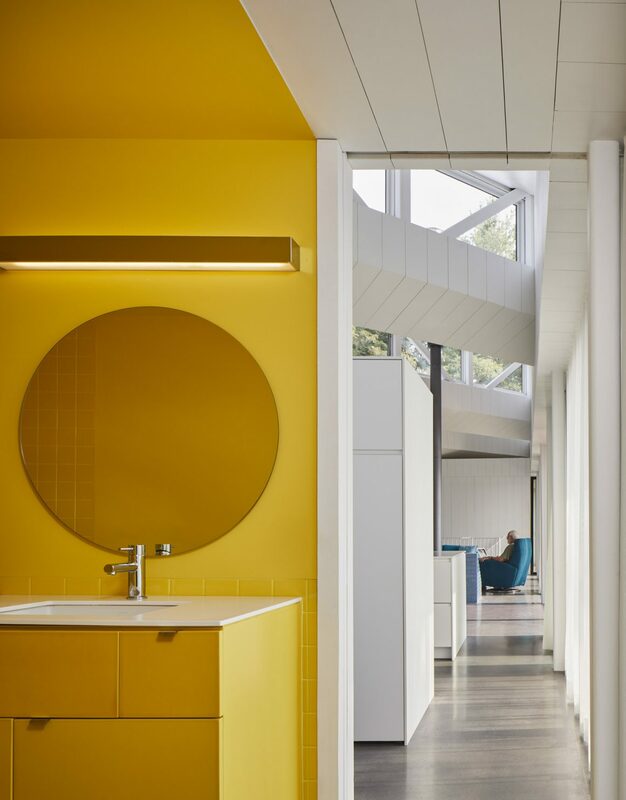 A little whimsy is injected into the decor through colour: canary yellow in the main floor bathroom and hot-pink coat hooks in the vestibule. The top block provides for a stunning lake view through an 80-foot-long glass wall of sliding doors. Of the three lower-level bedrooms, the master bedroom is located closest to the lake, at one end of the lower block, providing for even more spectacular water views. 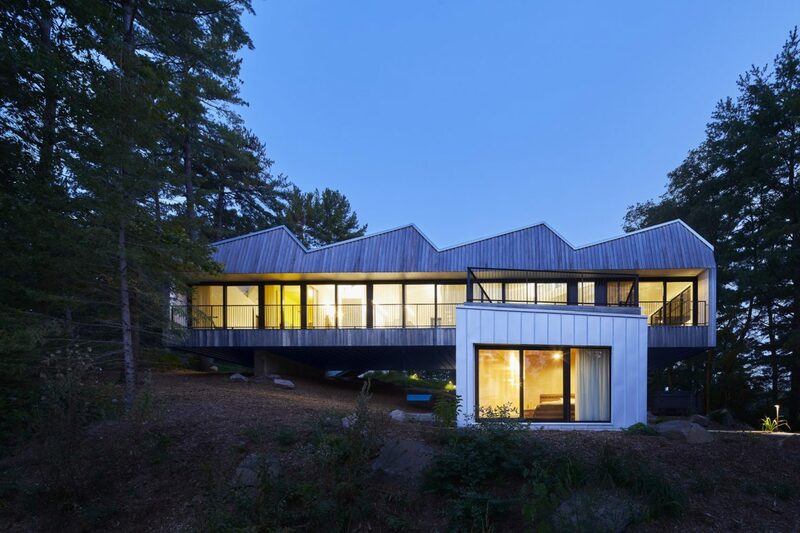 ‘Sky House’ glows at night surrounded by trees, rock, and lake, the trifecta of Canadian cottage country.